1. Competitive student funding for any of our 4 Masters programmes - one new major award of £5,000 and another 4 of £2,000. Please see www.nottingham.ac.uk/iessg. 2. Teachers of Surveying - the next meeting will held in Nottingham, on 17-18 December 2008. 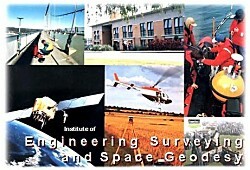 The Institute of Engineering Surveying and Space Geodesy (IESSG) was formed in 1988, although the surveying research group at the University of Nottingham was active for about 20 years before the establishment of the IESSG. The Institute is principally a postgraduate teaching and research centre, covering a wide range of multi-disciplinary research. Historically, the IESSG was founded on a long and established heritage in traditional engineering surveying and geodesy, with an interest in satellite systems since their early developments in the 1960s. For many years now, the core of the Institute's research activities has been centred around satellite navigation and positioning systems, but the Institute's multi-disciplinary activities also include photogrammetry, remote sensing, sensor integration and geographical information systems. The varied portfolio of research activities is funded by many different agencies including government and European organisations, research councils and industry. The IESSG currently runs four MSc courses, and has about 15 PhD students.